The Congress on Tuesday accused Prime Minister Narendra Modi, BJP chief Amit Shah and the RSS of attempting to murder democracy in Arunachal Pradesh by seeking to dislodge the party's government and charged the state governor with misusing his position. "Prime Minister Narendra Modi, the BJP and the RSS in criminal collusion with crony industrial houses is attempting to murder democracy and the constitution of India by subverting the mandate of people of Arunachal Pradesh who elected a Congress government in May 2014 with a four-fifth majority," the party said in a statement. It said the "dangerous game" involves "horse trading of MLAs, blatant allurement and threats" and subversion of constitutional provision and procedures. 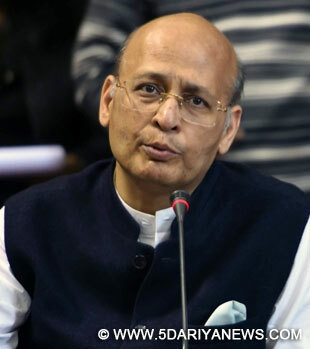 "Narendra Modi, Amit Shah, Kiran Rijiju, and Ram Madhav are bent on unconstitutionally toppling the elected Congress government of Arunachal Pradesh," the party said.The statement said that the BJP has "crudely pressurised" the state governor Jyoti Prasad Rajkhowa and the governor has "unconstitutionally made himself a willing tool for partisan and ulterior motives". Noting some dissident Congress legislators were lured by the Bharatiya Janata Party to topple the government in the state, the party said that governor has to act on advice of the council of ministers but was playing a "hideous game".It said that the assembly was to meet on January 14 but the governor "acting brazenly in an unconstitutional manner on the dictates of the central government and state BJP unit" issued an order for summoning the session on December 16 without knowledge of Chief Minister Nabam Tuki. "The governor has no powers to summon the assembly session without a proper cabinet decision. The governor has also set the agenda of the assembly session for which he has no authority," the party said.It said the governor Ahad directed that that removal of speaker shall be the first item at the first sitting of the assembly, deputy speaker shall preside over the first sitting and the issue of removal shall be completed on the first sitting itself and called it a "clear case of abuse of office". "The order of the governor sending a message to summon the assembly without the recommendation of the cabinet is illegal and unconstitutional," it said, adding the actions were also in violation of Supreme Court decisions.Accusing Modi of "double speak", the party said it will fight the "attempt to murder democracy and the constitution tooth and nail" in the courts, parliament and on the streets.At the party's official briefing, party's spokesperson Abhishek Manu Singhvi said Modi should apologise for the "unpardonable assault on federalism".